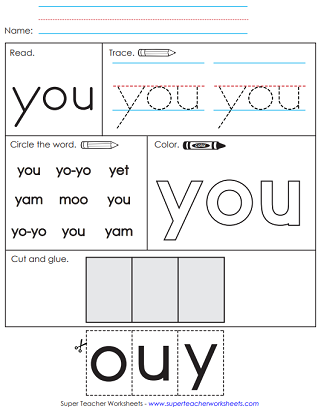 With the printable teaching resources on this page, students will work towards mastery of the following sight words: in, you, do, am and ball. Begin the unit by sending home a word list and home review activity. Then you can choose a few of the many related activities to complete in class. On Friday, you can give one of the sight word assessments. This is the sight word list for unit 4. 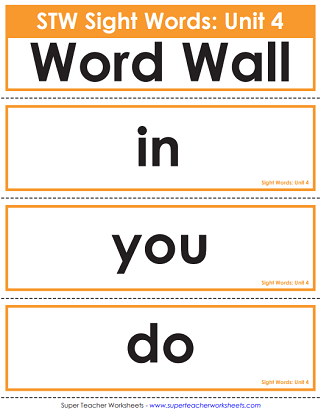 Students can take home their sight words to practice reading aloud with their parents. First students read each sight word. Then they trace along the dotted lines. Then they try to print it neatly on the lines provided. On this worksheet kids should carefully trace each sight word two times. You may choose to have them to use a pencil or a fine-tipped marker for this activity. On this page, student can practice their penmanship. First read the sight words. Then print each one twice. Use scissors to cut out the words like, do, ball, you, and this. Arrange them on the page to make the sentence, "Do you like this ball?" During learning center time, have your students use ink stampers to make sight words. Read the sight words from the sight word caterpillar to a friend or family member. Students can practice reading these six complete sentences. This page includes words from Units 1 through 4. 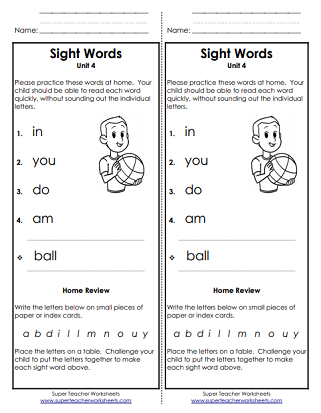 Read the sentences made up entirely of sight words from the first four Units of our Sight Word curriculum on this worksheet. Color, trace, and print the word in. Then use it in a sentence: "I am in the house." Circle the word you every time it appears in the word bank. Also practice writing and tracing the word. Near the bottom of the page is a cut-and-glue section too. After tracing and writing the word do, write it in the sentence. "Do you see the bear?" Then draw a picture. Color the letters in the word am. Then trace the word neatly and tell how many letters are in the word. Cut out the letters a-l-b-l and arrange them to make the word ball. Then circle the word ball each time it appears in the word box. Then practice printing the word. Have students read a list of this week's words. You can track their progress on these assessment score sheets. This PDF contains the biweekly 1-on-1 reading test for chapters 3 and 4. Many teachers prefer to use these biweekly tests instead of the weekly ones. You read sight words. Students circle the correct words on their papers. This PDF file contains a master list of all sight words in units 1 through 30. In the week ahead, your students will focus on the words: it, to, an, for, and girl.